The Laramie High School Boys Soccer team is off to 3 wins and 2 losses at the start of the 2019 season. Following a loss with Thunder Basin High School with a score of 2 to 1, the Laramie Boys’ team is still sitting with a winning record. This is a good start for the boys team who finished outside the top three in the state last year. Some might see a 3-2 season start as a poor one but the seasoned veterans on the team think differently. “Overall, though, I think we have the building blocks to make a really strong team that could be a state title contender,” team captain and Senior, Noah Dreiling said. 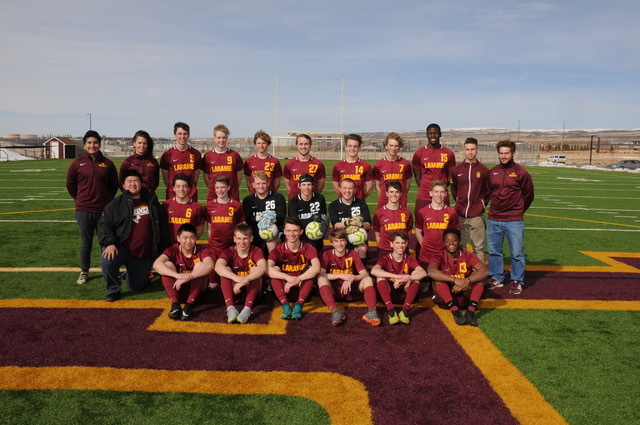 The last boys’ soccer state title was won by Laramie was in 2016 when the current seniors were freshmen and the team is looking to try to snag the championship this year once more. “We last won state in 2016 when I was a freshman, I didn’t play much, personally, but the entire bench stood for the duration of the game to cheer our players,” team captain and Senior Jordan Tangeman said. The team has a very high level of energy this year following the addition of the new head coach, Anne Moore. “Anne has been an amazing coach helping us meld together as a team and developing our skills as individuals. She has high expectations for us, but I think it forces us to work for our goals,” Dreiling said. “We got a new head coach, Anne Moore, who is inspiring us to work harder and achieve results,” Tangeman said. Any road to state titles comes with its trials and tribulations. For the Laramie boys’ team this started with an eye-opening defeat to Cheyenne South in overtime on Tuesday last week. “The loss to Cheyenne South taught us that we need to come prepared to every game and that winning starts at practice and as long as the team takes this loss as a reason to move forward and work harder to become a better team than I think it is for the better,” Dreiling said. Following the loss to South the Laramie team went on to lose another nail biter to Thunder Basin High School at home on Friday. “The first 15 minutes of the game were rough, Thunder Basin started off well, scoring the first goal of the game and we could not get into our groove,” Dreiling said. Following the defeat to Thunder Basin the team was frustrated and looking to work harder in practice the next week. “After a tough game like that we were all upset with the outcome. However, even with the poor conditions we were able to look at the parts of the game we can make better,” Dreiling said. The team will be playing at Cheyenne Central on Friday, April 5.